Depending on your mobile usage, your manual dexterity and your age, you may, or may not be using messenger apps such a Facebook Messenger, or Whatsapp. Like them, or loathe them, what you can no longer do is ignore them. Messenger apps offer a real opportunity in B2B marketing and are an essential consideration as part of your overall inbound marketing strategy. Figures show that the growth in popularity and use of messenger apps has been huge in the past few years. The top four messaging apps (Messenger, WhatsApp, WeChat and Viber) now have more monthly users than the top four social networking apps (Facebook, Twitter, Instagram and Google+). What’s more, this happened in 2015, and messenger growth has been exponential since then – for example; in 2016 the time spent on mobile messenger apps increased almost four times (394%). In June 2017, Facebook Messenger and WhatsApp both reached over 1.2 billion users worldwide. It’s perhaps not surprising that Facebook Messenger is proving so popular, given Facebook’s dominance in social networking. Their users prefer to use Messenger to interact with companies too - with over 65 million businesses active on Facebook; this shouldn’t come as much of a surprise. An estimated 80 percent of these companies use messaging to reach Facebook Messenger’s 1.2 billion monthly active users. If you were thinking that messaging apps are just for personal communications, consider this: Nielsen’s Facebook Messaging Survey showed that messaging ranked second out of nine possible modes of communication with business and that 53 percent of people are more likely to shop with a business they can message directly. What’s more, according to Facebook over 2 billion messages are sent between people and businesses — including automated conversations — each month. You won’t be surprised to hear that millennials (Generation Y) are the most enthusiastic about the use of web chat systems but Generation X is really not that far behind. There are two great ways businesses can use these messenger apps: for prospects and customer service. Setting up a messenger account gives you another channel for prospective customers to contact you. Whether they are researching products, have questions about your services, or want to have technical specs or facts sheets sent to them, messenger apps are an excellent way for them to contact you. Messenger apps are fast replacing the phone as a channel to make that initial query or make that first contact. People no longer want to be contacted by Sales, or indeed, have to speak to Salespeople until they are ready. 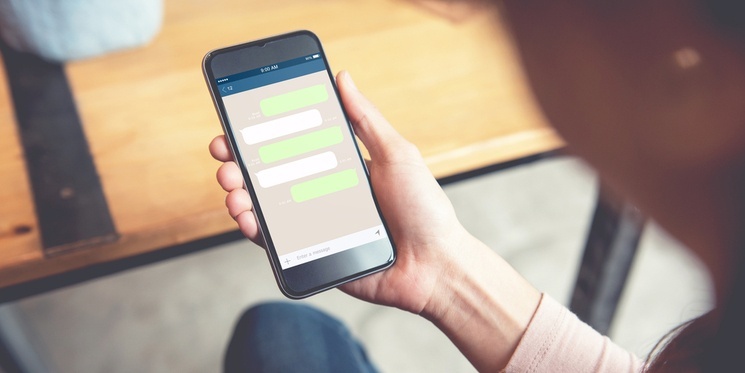 Given that 56% of people would rather message than call customer service, it makes sense to establish a messenger account that answers customer queries – the text equivalent of a phone support line. As more and more people spend more and more time on messenger apps and social media, asking a question online will become a first choice – natural and effortless. With automated phone systems rapidly being seen as outdated and archaic, 67% of millennials prefer messaging. In recent years many businesses have been frantically building proprietary apps for their products and services. So why not build an app for customer support and prospect queries? After all, using messenger apps is building on ‘rented land’ so to speak. Well, the problem with apps is that most smartphone users only use around nine apps on a daily basis. And when you consider that they are very likely to be using email, maps, a web browser, contacts, calendar, Facebook and YouTube as seven of those at least, then other apps barely get a look in. And the long-term prospects for an app are bleak, research from Quettra shows that the average app loses 77% of its Daily Active Users (DAUs) within the first three days after the install. Within 30 days, it’s lost 90%, and within 90 days, it’s over 95%. Getting users to find, download, setup and use your app creates lots of friction – lots of hoops to jump through; which results in poor take up and an even smaller user base that dwindles quickly. On the other hand, messaging apps are already installed on user’s phones so, there are zero barriers to adoption. First steps – gaining a presence – setting up your messenger app. There are a few popular messenger apps out there, so the first step would be to choose which one(s) to support. Facebook Messenger is one of the easiest – if you have a Facebook business page, then you already have a messenger hub. It’s easy to set up automated replies for when you can’t answer messages and set up standard replies. Facebook has a few tips here. You can also add a “Send Message” link on your web page, in your emails, online ads, or anywhere else that it’s appropriate, that starts a conversation. Research by HubSpot has shown that this generates significantly more engagement than a phone number or email address. HootSuite has a page of tips on business use of Facebook Messenger. You can extend this further by the use of chatbots, again, HubSpot has a great example of chatbots replacing forms for content delivery, which resulted in a staggering 477% reduction in cost per lead. Perhaps the most surprising thing you might learn today is that the vast majority of online sharing – 84% – now takes place on private channels (known as Dark Social), like direct messaging, so your audience is likely already using them to share your content and extend its reach, without you being aware of it, able to measure its impact, or influence it. Given the manpower and resources, it makes perfect sense to set up messaging channels – giving your prospects and users an easy to use, quick and effortless way of contacting you in a way they prefer to use. It’s not hard to appreciate that doing so will result in more prospects and more satisfied customers.